On 1 July 2015 I stepped into my office for the first time as Director General of the European Space Agency ESA. With my previous experience as Head of the German Delegation to ESA and Chair of the Executive Board of the German Aerospace Center DLR I had some idea of what might lay ahead. 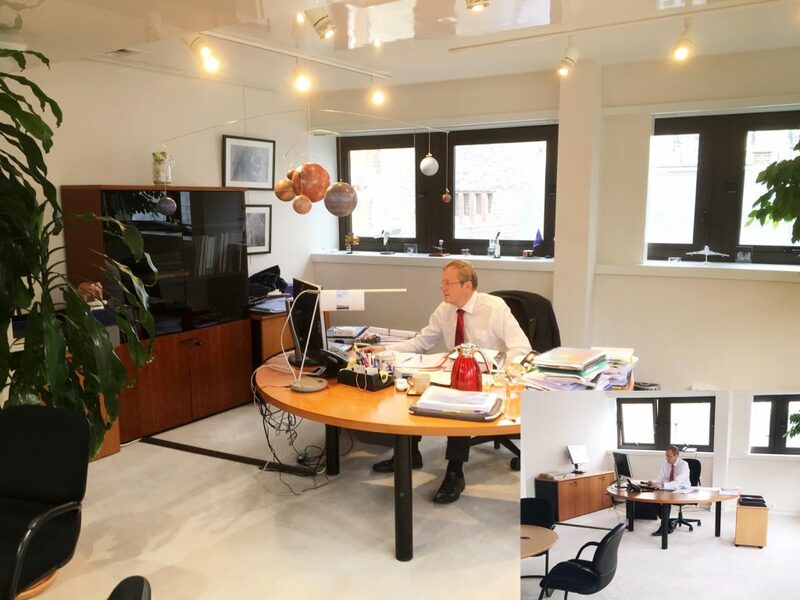 ESA DG Jan Woerner in his office, one year later, July 2016. Image credit: ESA – T. Weissenberg. My initial reception at ESA was very friendly, and that made things much easier in those early days. 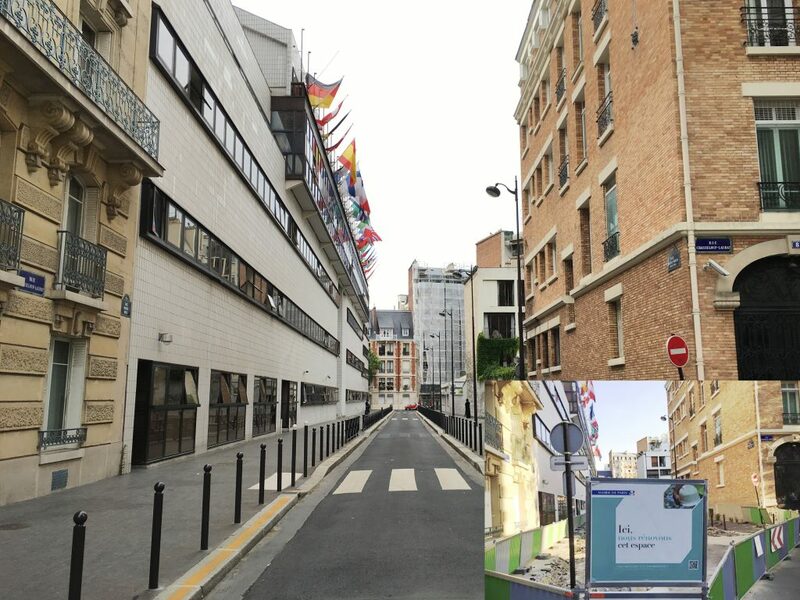 Since my arrival coincided with that quiet period in France that follows on from 14 July, to begin with everything was relatively straightforward and incident-free. At the same time, I was excited to be entrusted with the task of contributing, as head of the European Space Agency, to Europe’s positioning in space. One year on, I remain just as enthusiastic about that task, which involves dealing with ESA Member States, the European Commission and various international partners. Space today has ceased to be a question of national prestige; every bit as important are its contributions in terms of infrastructure, as a source of information and as an instrument of industrial policy. My exchanges with ESA people across the Agency’s various sites have always been very inspiring. Visiting these various sites, I can inform staff about recent developments and my positions on the different issues of the day and they, in return, can challenge me with questions, comments and recommendations. These lively discussions with them are very important to me. In times like today when we face multiple challenges — economic crisis, issues surrounding migration, climate change, terrorism and also scepticism over joint European action — space can help inspire and point to a future founded on a sense of wonder and creative energy. Regrettably, with acts of terror now having occurred across a range of locations, you might argue that the perpetrators have already achieved some of their aims as society has moved to protect against future threats by introducing special security measures which inevitably place restrictions on freedom of movement. Though I have at times been deeply affected and saddened by external events, I have also been greatly encouraged to see for myself the very high levels of commitment and motivation of the people who work for ESA. This positive picture I have of the Agency is only enhanced by its international profile and the recognition it receives for the work it does. Unfortunately, mixed in with this were some far less positive experiences, in particular, the death of some very dear and, to me, very important people, most recently Horst Rauck, who had supported me with advice and in deed ever since 2007 in my various roles and was one of those who persuaded me to apply for the position of ESA Director General. My last opportunity to talk to him about the outlook for European space activities was at ILA in Berlin, barely a few weeks ago. One topic which accompanied me throughout the year was the future shape of space activities in Europe, my vision for which can be summed up in these two terms: “Space 4.0“ and “a United Space in Europe“. Space 4.0 is the expression I use to refer to the paradigm shift we are currently witnessing, while “a United Space in Europe“ encapsulates how Europe’s space institutions — by which I mean especially ESA and the European Commission — should be working together. With Britain, sadly, having decided to leave the European Union in the recent referendum vote, both of these expressions now take on all the more significance: we must ensure that we shape our cooperation in a transparent way, notably vis-à-vis Europe’s citizens, and in close coordination with our Member States, if we are to strengthen the trust of the European population at large. This is particularly true when it comes to the European space strategy. It is the responsibility of the various European players in space to generate trust in Europe’s space efforts, based on the coherence and cooperation required from institutions acting in the European interest. We can and should work hand in hand to promote European identity, spirit and cohesion. A wonderful retrospective article. While you rightly point out current fears and the challenges ahead, I’m glad the preceding 12 months have also filled you with great satisfaction and optimism. Thank you for your first year of leadership of ESA! You have significantly moved forward the idea of a united to space for Europe! Brexit will add complications, but it should not impede progress. Space can be a unifier for Europe even as debate intensifies both that the EU level and at the level of the member states as to where Europe should go from here and how to organize for the journey ahead. You are eloquent in calling for a “Space 4.0” that is consistent with “Industry 4.0”, but we need to be preparing for the new paradigm “Space 5.0”, for the self-sustaining space economy. In this paradigm lunar, asteroid and Mars ISRU become the source of most materials used in space – water, fuel, structural parts, soils, solar cells, solar concentrating mirrors, spacecraft. As ISRU technologies are proven and markets emerge space resources will become the source also of the capital to fund further space development. The tipping point for “Space 5.0” can be achieved by 2030 if there is a framework for international collaboration that spans the Moon Village, cislunar infrastructure, asteroid mining, NASA’s Journey to Mars, planetary defense, climate change and other vital concerns. The International Lunar Decade Working Group has called the framework for international cooperation the International lunar Decade whose goal is to reach the tipping point by 2030 where a self-sustaining space economy becomes clearly attainable. To make possible the International Lunar Decade the EU would need to adopt the idea of the EU becoming a global leader for space development. This is not that the EU would spend more or be ahead of all other nations in space technology. Rather it is that the EU would use its unique structure and attributes to exercise leadership. The EU works with all spacefaring states and is not hobbled like the US with restrictions on cooperating in space with China. EU funding mechanisms like Horizon 2020 can accommodate partnership with any country that wants to collaborate. A starting point would be to include “Space 5.0” as a goal of the Global Strategy for Europe. http://www.euractiv.com/section/global-europe/opinion/mogherinis-new-global-strategy-offers-lighthouse-for-eu-in-uncertain-waters/. While the Gobal Strategy prepared under the leadership of HR Frederica Mogherini is indeed a “lighthouse for EU in uncertain waters” the Strategy that are vital for Europe’s future, it largely ignores space. The only substantive reference to outer space in the strategy is on pg. 42, “In space, we will promote the autonomy and security of our space-based services and work on principles for responsible space behaviour, which could lead to the adoption of an international voluntary code of conduct.” In an era when Luxembourg is investing hundreds of millions in asteroid mining, Elon Musk is planning the colonization of Mars the EU needs to make space a higher priority. If space development can serve as a unifier of nations at peace as well as nations in competition its unrealized potential for collaboration needs more attention. The Global Strategy stresses following a rules based global order. There is no rules based order in space yet major spacefaring powers are developing technologies to mine the Moon, Mars and asteroids. What policies should govern mining the asteroids? Luxembourg and Denmark have developed space law to begin to address such questions. Most EU member states lack national space laws to address the ownership of resources extracted from asteroids or the Moon or other celestial bodies. Space law is not consistent among the EU member states.